This LP has 9 parts. Original Thread: "Punch the World. With Your Feet." - Let's Play Punch-Out!! Wii! Punch-Out!! 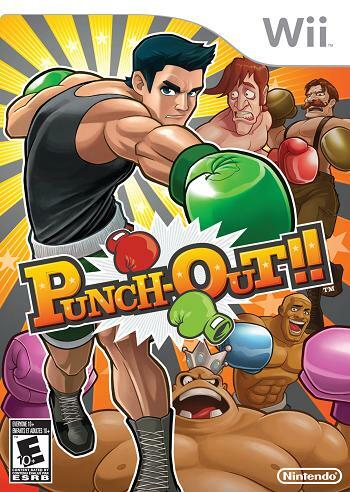 Wii is a remake of the classic NES, SNES and arcade Punch-Out!! games. While visually a boxing game, it plays more like a puzzle game: the player fights their opponents with careful timing to dodge their attacks, hit them while they're open, and rack up Star Power for super-powered punches. Knock out your opponents three times in one round, or find their secret opening and take them out instantly. You are Little Mac, a very short boxer with everything to prove. With the help of your trainer, former heavyweight champion Doc Louis, you must fight your way through a cavalcade of colorful, cartoony characters who run the spectrum of global stereotypes. Earn that world title, and chomp that chocolate bar! I will be playing through all six circuits, Mac's Last Stand, show off Champions Mode and Doc Louis's Punch Out, with ThornBrain and BigTUnit1 as co-commentaters. Each fight will be two rounds: the first round will show how to fight them and what they do, as well as what they and Doc Louis say between rounds. The second round, I annihilate them.